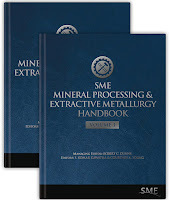 The SME Mineral Processing Handbook was first published in 1985 and rapidly became a standard reference, providing comprehensive coverage of all the unit operations in mineral processing, descriptions of process plants for more than 26 minerals and materials, and small sections on hydrometallurgy and pyrometallurgy. The authors of its many chapters contributed their collective expertise unselfishly to provide a handbook that was truly useful to all the practitioners of mineral processing—students, engineers, mill managers, and operators. The search for an editor to take on the task of producing an updated handbook began in 2012, as the previous handbook went out of print in 2003 and there was a steady and undeniable demand for a new version. Professors S. Komar Kawatra and Courtney A. Young from Michigan Technological University and Montana Tech, respectively, submitted a joint handbook proposal that incorporated both mineral processing and extractive metallurgy. The proposal was unanimously approved by the SME Information Publishing Committee in 2013. After six years of intense work by the authors, reviewers, editors, and SME book publishing team, the new SME Mineral Processing and Extractive Metallurgy Handbook is now here, comprising two volumes of 2,312 pages, with 128 chapters. Once again, each chapter is authored by an acknowledged expert. These selfless experts, recruited by the editors, have each made an invaluable contribution. The chapters were skilfully organized and refined by the managing editor, Dr. Rob Dunne, of Rob Dunne Consulting, Australia, with the incomparable assistance of SME’s book publishing team, led by Jane Olivier, manager of book publishing, who initiated the project. The new SME Mineral Processing and Extractive Metallurgy Handbook, which will be launched at the SME Annual Conference in Denver in February, provides up-to-date coverage of all mineral processing unit operations, but it also has much larger sections on hydrometallurgy and pyrometallurgy as well as a section on management and reporting, which discusses such topics as health and safety, community and social issues, and project management. The new SME handbook is truly a timely document, addressing the new technologies and important cultural and social issues that are important to today’s minerals community. How do you buy the book and how much?